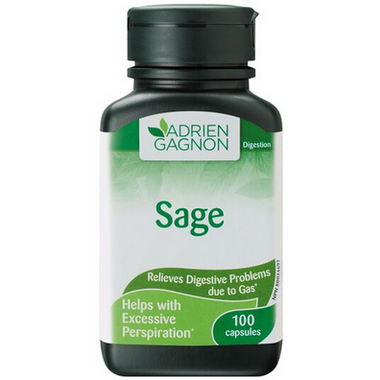 Adrien Gagnon Sage relieves digestive problems due to gas and helps with excessive perspiration. Note: Sage is generally used with other digestive plants such as coriander, sweet balm and mint. It is also used with depurative plants such as burdock, sarsaparilla and dandelion. Consult a healthcare practitioner for use beyond 4 months. This product sae my life ! I've been taking it since march 2016 and it helped so much with night swet from menopausis. Well, here I was, late forties and all of a sudden the hot flashes started. I was getting them so bad that I barely slept for over 2 months and had to consistently change my shirts. The discomfort and havoc these were creating on my life nearly drove me mad! I tried Evening Primrose oil, which did nothing for me. I have 2 immediate ralives who had breast cancer, so HRT was not an option for me. So, I kept resarching and came upon articles from the UK that mentioned Sage. I figured I had nothing to lose, so I tried it. Boy, was I surprised 10 days later when all of a sudden, they completely disappeared! Nothing! Not even a warm glow! All gone!!! I am now catching up on my sleep and am getting my life back. I highly recommend this product. The price is more than adequate and the packaging is easy to open. I am definitely going to continue taking these!